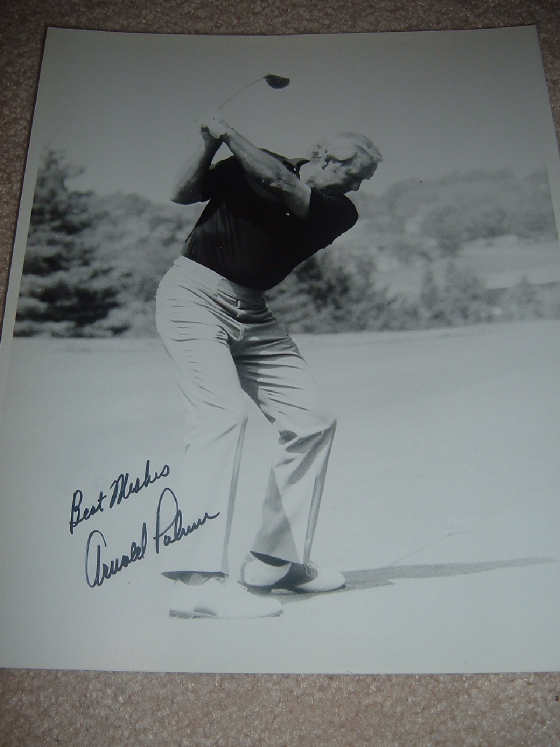 Arnold Palmer is "The King" but don't call him that, as he does not like it. He is the King when it comes to signing autographs he is very gracious and signed through the mail forever. For mail request he now uses the help of a autopen machine which reproduces his autograph for him. 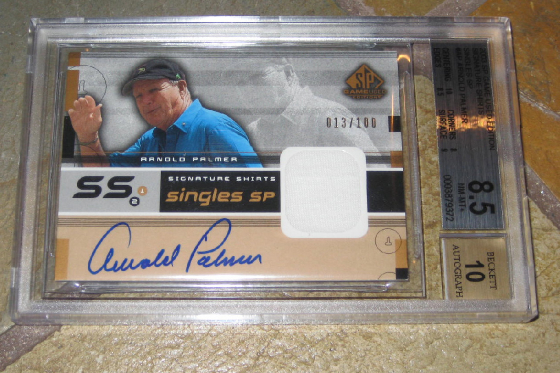 I have included examples of his autopen pattern which is being sold as a genuine autograph. **A highlight for me this past year was attending the World Golf Hall of Fame Induction for 2007. 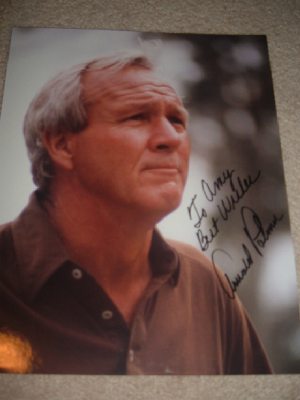 I was able to sit right next to Mr. Palmer for 30 mins at the bar and just shoot the SH**. He could have not been any nicer. It is truly something I will never forget. It is always great to get a autograph, but to be able to spent time and talk to a true hero was something. 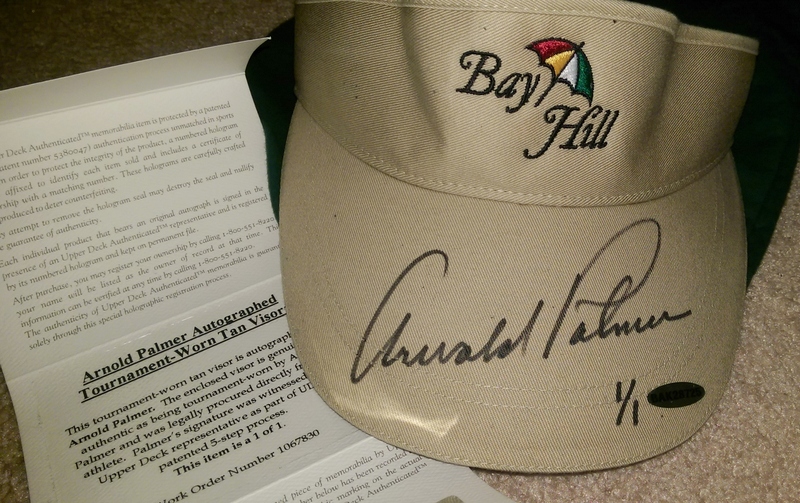 This is a Tournament used Hat/Visor signed an Arnold Palmer. You can't get a better autograph then this one. Upper Deck offer this item a few years ago. I was able to purchase the 1960's Arnold Palmer Tournament used golf club. 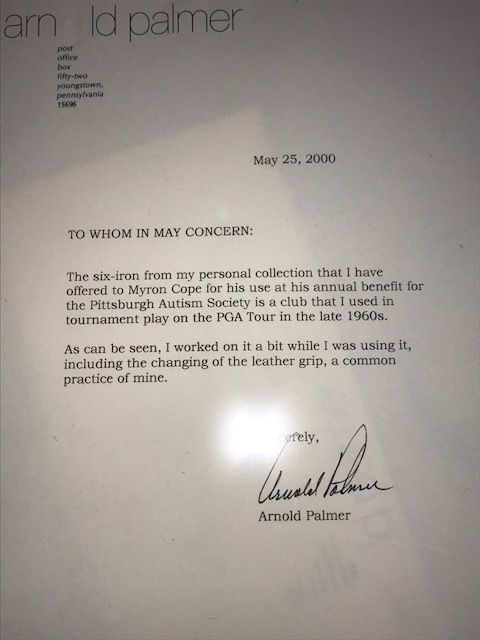 It comes with a letter from Mr. Palmer and I love when he says he has Worked on the club a bit when he was using it, which is a common practice of his. Love this item. A signed original 1958 Official Masters scorecard his first Masters victory. 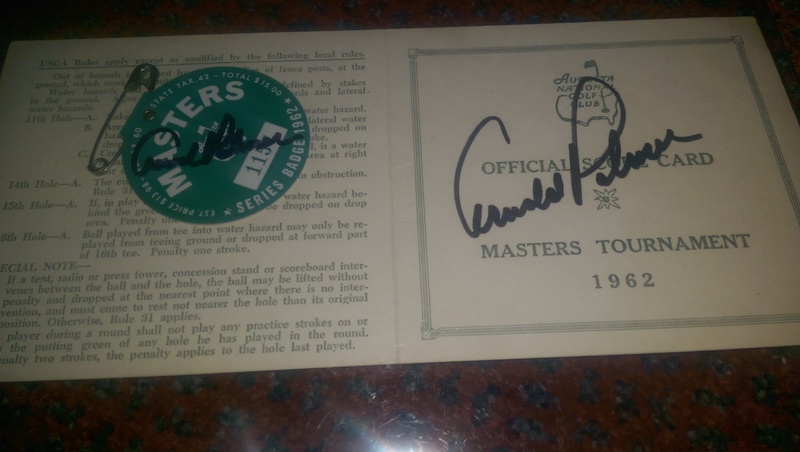 A signed 1962 Masters Badge and a signed official 1962 Masters tournament scorecard. 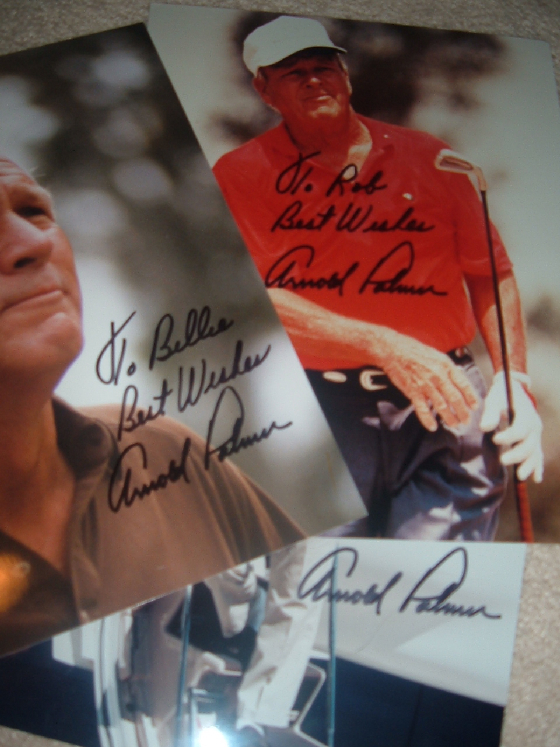 He signed these at the 2015 Open Championship Golf HOF dinner. 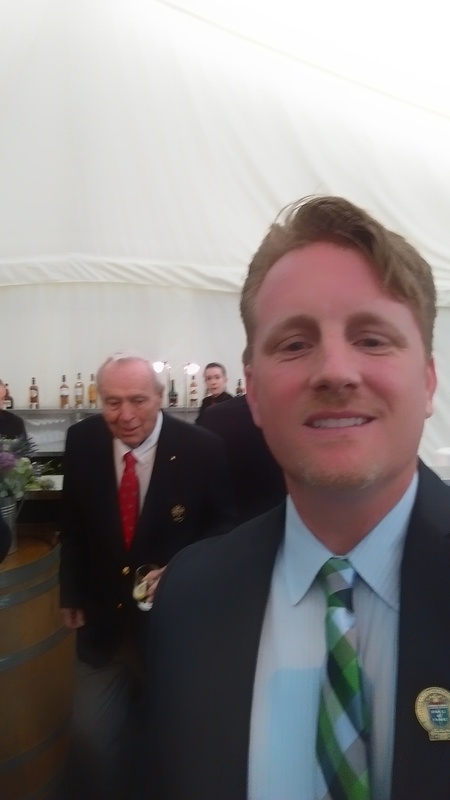 Me leaving the Bar with Mr. Arnold Palmer at the 2015 Open Championship and Golf HOF induction Ceremony. He asked for Kettle One Vodka but had to drink Grey Goose! I'm adding this for fun. 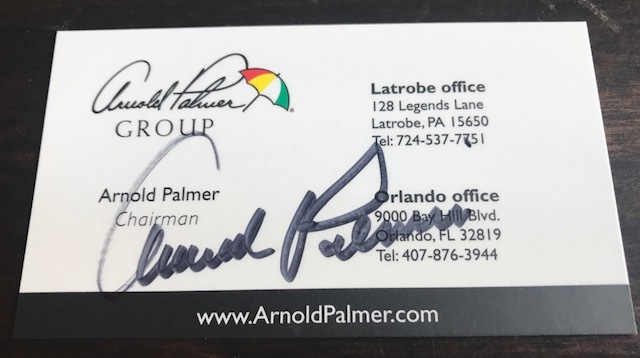 I attended the Golf hall of fame induction a few years ago and I was sitting at the bar having a beer and Mr. Palmer sat down next to me and had a few drinks together. He drank Kettle One Vodka. Really cool and truely one of the greatest people I have ever met. 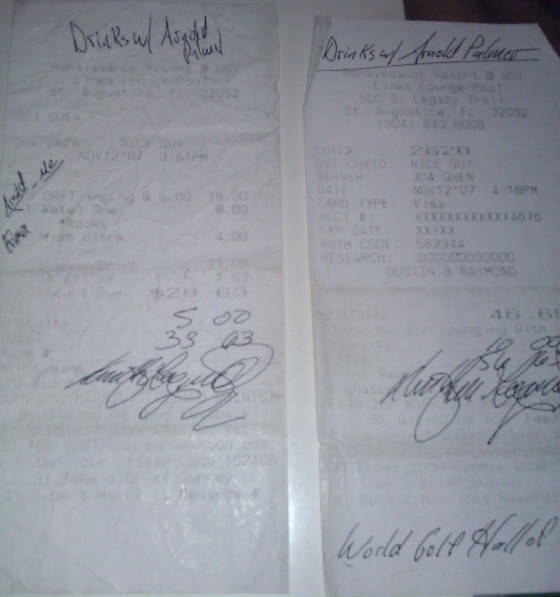 Receipts from me buying the drinks. We talked about him losing the 1960 British Open to Kel Nagle etc. 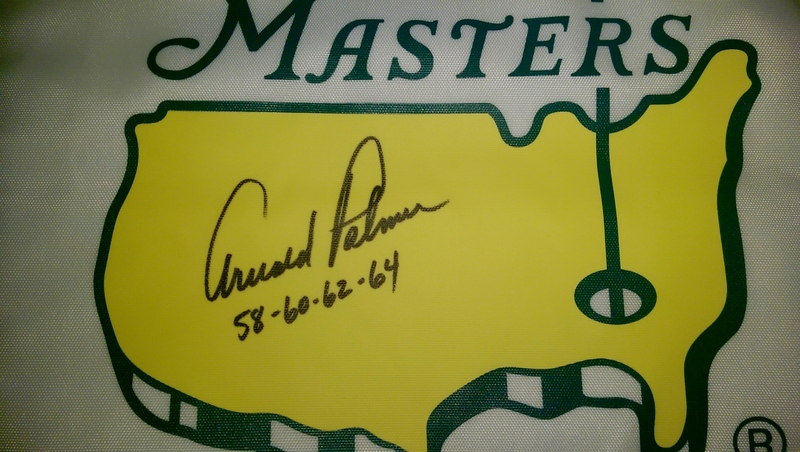 A perfect autograph on a Masters Garden flag with the Years he won. VERY NICE AND RARE! A signed US Open Ticket from the 1966 US Open Signed by Ben Hogan and Arnold Palmer. Autopen signed photographs Notice all the autographs are exactly the same. You can tell a autopened Palmer by the A in Arnold it is always a Perfect A.